Yet another possibility with Windows 8 is here! This time its the language option its and very helpful for people issued with translations. Most of users want the Windows in their native language and Windows 8 provides this facility. 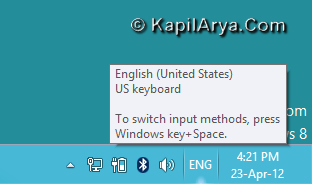 Following option is shown in notification area when you add a language in Windows. 1. Its very simple and can be done using General section of PC Settings. Pick there the Go to Language in Control Panel option. In Windows 8.1, follow PC Settings -> Time and language -> Region and language and you can add new language from that page itself. 2. In the Language window, click on Add a language. 3. In Add languages window, pick your favorite language which you want to add. Suppose we added Hindi. 4. Now Hindi will be shown in Language window. You can preview the keyboard from Options. To remove a language, like Hindi in this case, simple click on language and click Remove like we do in Add or Remove programs. For Windows 8.1, follow PC Settings -> Time and language -> Region and language and you can remove a language by clicking on it and selecting Remove.